One of the affected houses. Flash flood at one of the roads. 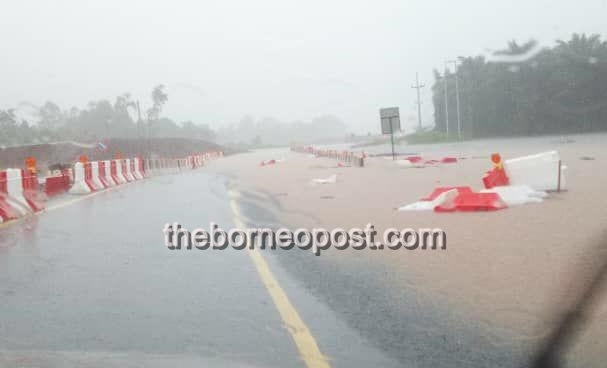 KUCHING: The folk in several villages in Lundu and Sematan have been asked to be prepared for evacuation if the flood situation worsens following incessant heavy rains. The affected villages include Kampung Paon, Kampung Sebat Dayak, Kampung Sebat Melayu, Kampung Temaga Dayak, Kampung Temaga Melayu and Kampung Sebat Baru. Sarawak Disaster Management Committee secretariat spokesman said incessant rains have caused low lying areas to be inundated and rivers to overflow to nearby houses. “As of 8am today, some houses are already inundated by one to two feet of water. “The Civil Defence Force (APM) have advised the village chiefs to prepare for evacuation if the situation worsens,” he said. He added APM personnel are now monitoring the situation.